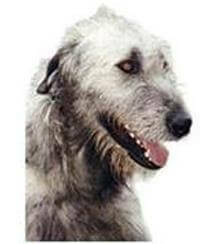 The Deerhound, the Royal Dog of Scotland, was bred in the Highlands and Western Isles of Scotland. Bred to run down, catch and kill the red deer, it is built for speed and stamina. Revered for its courage and tenacity as a stag hunter, it was not until the introduction of improved firearms that its skills were no longer in great demand. Deerhounds have been in Australia since early colonial times and were a much-needed aid in supplying meat, by keeping down the kangaroo population. Later they were used for killing the dingo and fox that preyed upon the sheep flocks. Deerhounds live from 7 to ten years of age. This too, is another big dog with the females weighing up to 35kg and reaching 71cm in height, with the males being about 50kg and 76cm tall. The Deerhound is loyal and dignified and adores children and is an ideal family pet. Though a big dog it’s patient and docile, but can be called upon to act against intruders if needed. A Deerhound should live happily with other household pets. However, since they were bred to chase and catch game, the sight of a small animal running may trigger a response. Your Deerhound may share companionship with your indoor cat, but may change its attitude outdoors when a cat runs past. Most owners report their Deerhound and other pets get along fine, but it is best to use caution to prevent any ‘chasing mishaps’. The adult Deerhound enjoys as much exercise as you can give it. A puppy will exercise sufficiently by just playing with the family or other dogs each day. Some Deerhounds can be extremely sensitive and need almost no disciplining, where others try your patience to the limit. The Deerhound requires only moderate grooming. If a Deerhound is an outdoor dog it needs to be provided with a draught-free kennel not too far from the house as Deerhounds like to be close to the family and will feel rejected if banished outside. Deerhounds like to jump and can easily clear the average garden fence or even higher. A secure yard must be provided as Deerhounds have almost no road sense and can run more than 60kph. Deerhounds are probably not going to bring back that stick you throw, most likely will not bark and growl when someone approaches your front door, and the roast you put on the kitchen counter to defrost is an open invitation for a Deerhound to snack. It's big, busy as a puppy and prone to long naps as an adult. Deerhounds are sweet, tractable, lazy dogs not excelling in obedience work. If a Deerhound is not given companionship and direction as a youngster, it can develop into a headstrong, boisterous and unruly animal. People who do not spend long hours away from home on a regular basis and are prepared to accommodate its need for exercise, quality food and good health care. This includes having a large fenced area in which the dog can exercise.